When .hack//Sekai no Mukou ni (or “.hack//Beyond the World” tentatively) came out short of a month ago it had big shoes to fill. Ever since the .hack//G.U. PS2 games the .hack multimedia franchise has been on a steady free-fall. The .hack//Trilogy movie, .hack//Link PSP game and .hack//Quantum OVA have all been failed attempts to fuel the franchise. They did contribute to the franchise in terms of plot, but failed to be a magnet for newcomers or to impressing the old fans who’ve been yarning for a new and exciting .hack experience. What the .hack franchise really needed to ascend from its poor state is something easy to define but hard to accomplish: a movie that will be easy enough for newcomers to follow, yet engrossing and rewarding enough for the older fans. A movie that will immerse us in The World like the first anime and games did. A new plot that does not replicate the old formula. Fortunately.hack//Sekai no Mukou ni does that, and much more. In 2024 almost every teenager plays the online game The World. FMDs (Face Mounted Display) can now connect to your phone and you can play online even on the go. Technology has evolved to incorporate more connectivity via the internet, and even tests are now done on a touch-screen computer. However for 17 years old Sora this matters little. She comes from a strict home and has never played any computer game. That is until she reluctantly tried The World and learns the joys of adventuring in a virtual world with friends. But not all is well in The World: a malicious virus has been spreading around the net and will soon cause a new network crisis. Aura, the omnipotent goddess of The World has devised a plan to stop the virus, and although Sora might not know it yet that plan requires her cooperation. Why is .hack//Sekai no Mukou ni better than all the latest iterations in the .hack series? Because it is different. In terms of plot it doesn’t rely on any .hack media that came before it and as a result everyone can enjoy it. It also changes the focus of The World. Previous iterations in the series have made it a custom to focus on coma victims and the crisis that caused their mysterious illness. Sekai no Mukou ni has a bit of that but tend to focus more on the special experiences one can have in The World. Most of the time is spent showing you how The World looks, feels and plays. An equal amount is used to introduce you to the futuristic real world, so that you can appreciate the setting as much as the happenings. The movie allows you to enjoy the environment of The World similarly to how you would enjoy a real MMORPG. As a result it feels more fresh and less repetitive. It also helps that it has a coherent and satisfying ending (as opposed to last years’ .hack//Quantum). There are several key features that make .hack//Sekai no Mukou ni more immersive than previous iterations. The first one, as I mentioned above, is the focus on The World itself. The second are the visuals. There are a few little annoying quirks to the movie. Let me start by saying that the movie doesn’t play on full screen – it has black bars on the top and the bottom. These won’t distract you that much but it eludes me why a movie still has these in this day and age. In terms of characrter models I found it a bit dissapointing that the movie recycles the Kite character we’ve come to see far too much in the .hack universe, despite the fact that this time arround there really wasn’t an important reason to have this specific character design used. Also the character models of the people in the real world in the movie do look a bit on the dull side. The CG style used here doesn’t land itself well to things like mouth flaps or subtle movements. However, this crispy and colorful CG style does excel in portraying environments and you will find plenty of incentives to look around while the movie scrolls by. As the movie takes place in a not-so-distant future it shows many machines and functions that just may be possible in the near future. So not only do you have the privilege of looking at detailed backgrounds – these backgrounds also give you hints at a rich and valid futuristic world. In contrast to the futuristic, yet gray, real world the online game world breams with colors, layers and online-related context. However, all of these are just the icing on the top. The real immersion from this movie comes from an unexpected direction. .hack//Sekai no Mukou ni isn’t just a CG movie, it’s a CG movie made from the ground up in 3D, just like Avatar. I bring Avatar up on purpose, because the only movie that uses 3D on the same level as Sekai no Mukou ni is Avatar. Yes, you are reading this right: this movie’s 3D effects, and the immersion in a 3D world that stems from them, are on par with Avatar. .hack//Sekai no Mukou ni doesn’t have specific scenes in which you see glimpses of 3D. The 3D effect is always on. These effecs contribute plenty to the more boring real world, and when you get to see the online game The World in full HD and 3D you will be hard pressed not to be impressed. I’ll say this one more time: .hack//Sekai no Mukou ni looks amazing in 3D, and is probably one of the best movies that make us of 3D as a hook. And the immersion doesn’t stop there. The movie pulls you in in another clever ways. The characters use glasses (FMDs) to access The World, and when you watch the movie in 3D you use those glasses too. Those glasses that Sora puts on in order to immerse herself in The World? You’ll be wearing them throughout the whole movie. You don’t simply watch .hack//Sekai no Mukou ni; you experience it. 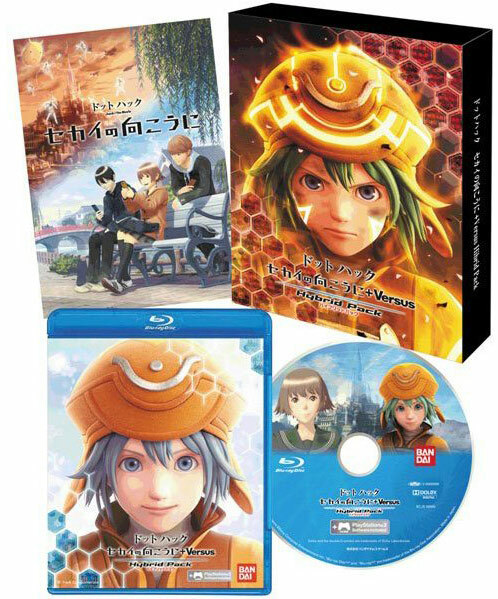 If you’re a .hack fan than you probably know that the Blu-ray version of this movie contains .hack//Versus – a full PS3 game, complete with extra cinematic scenes and online functionality. I won’t be reviewing Versus here, as it will have its separate review. However, .hack//Versus is not the only extra this movie has to offer. The standard version of the movie includes a sturdy cardboard art box, the movie Blu-ray and a booklet. 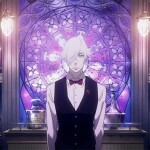 Inside the Blu-ray you will find extras such as a 25 minutes TV special shown in Japan to introduce the movie, alongside several movie trailers. None of these are commendable, but the booklet that comes with the package is. It first begins by outlining the plot and introducing the characters, but from here on it becomes a bit more interesting. One important page contains an encyclopaedia-like description of all the important terms from the movie, such as Sophia and Algos company. But the booklet doesn’t stop there. The rest of its pages are dedicated to showing you where the movie was “filmed”. You see, although the movie itself is completely fictional and was created in CG it reflects real places in Japan. Want to visit Sora’s hometown? You can. Want to eat that meal they ate in the restaurant? You can. The booklet teaches you about the places and items these scenes were based about. It really is a nice little extra in itself. 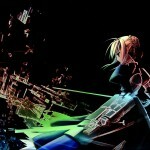 .hack//Sekai no Mukou ni is a must see movie, one that I believe everyone should watch. Of course, it’s not widely accessible to everyone at the moment since the Japanese Blu-ray doesn’t have an English dub or English subtitles. The question whether or not the entire package (movie, game and booklet) will be localized is a hard one. This is no normal anime movie and the only precedent of a localized 3D CG movie and game pack (the Tekken Hybrid pack) was done on a much smaller scale and for a much bigger audience. Tekken is still more popular than .hack, the Tekken 3D CG movie was only a short little OVA and the included game was merely a demo. In comparison .hack//Seaki no Mukou ni is a full-fledged 112 minutes movie and .hack//Versus is a 3D game with online support and in game movie clips. It would be great if Namco Bandai will translate the entire pack into English, but even a localization of the movie alone will be a treat worth waiting for. Review equipment: an LG Electronics Japan HD LED passive 3D 27 inch PC monitor (D2770P-PN) connected to a PS3 using a ver. 1.4 HDMI cable.